The Pope is dead. Cardinals from all over the Christendom begin to arrive in the Vatican to choose the new Pontifice. The last Cardinal to arrive in Casa Santa Marta is the Archbishop of Baghdad; he claims to having been created in pectore (kept close to the chest, as in secret). His documentations support his claim, and he is admitted. As Cardinals assemble in a conclave, factions emerge and personal interests align according to the currents extant in the Church today (i.e., traditionalists, moderates, liberation theologists, etc). On one side are the Third World Cardinals, grouping those of Africa, Latin America and Asia. The North Americans have a contingent as well, as do the Europeans and the Italians. The Italians in particular, are divided into two factions; those who support the Patriarch of Venice—a staunch traditionalist—, and those who see the more moderate former Secretary of State, Cardinal Bellini, as an attractive alternative. In the middle of it all, is Jacopo Cardinal Lomeli, the Dean of the College of Cardinals, who with steadfast leadership will have to keep those interests in check to prevent further divisions in the Church. Years ago I read two books in Morris West’s Vatican trilogy that are, for me at least, the stick with which I measure every book on Vatican politics. They were not only well written, but turned out to be prophetic as well. I also read White Smoke by Andrew Greeley, a novel about a conclave written by a priest-author. I have also made quite a bit of research on Popes, Vatican politics, and a Pontifice election process. So as I was reading Conclave by Robert Harris I kept telling myself that he wasn’t breaking new ground with this novel. 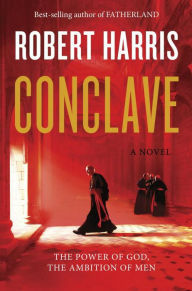 Robert Harris certainly didn’t tread new ground in Conclave, but the politics and trivia he went into, he nailed. He also commented on current affairs of the Church as a keen observer. In addition, he managed to breathe life into one of the most bureaucratic machines on earth. And let me tell you, that conclave was far from boring…And that ending! Oh, my! In my opinion, Robert Harris succeeded in making his readers aware that while the election of a Pontifice may be guided by the Holy Spirit, there are men with ambitions and agendas doing the choosing, and those elements come into play to influence the outcome. If you are into Vatican politics, as I am, you will appreciate Robert Harris incursion into this sub-genre. If you are not into that, you may read it and learn new things in the process. Great review Carmen! I am glad you are reading and reviewing books again. I do like books about the Vatican, for some reason, though I have never been Catholic. Thanks, Judy! Yes, I'm reading more nowadays, but I'm also watching no movies, so I think it's a trade off. The Vatican fascinates me as well, probably because it is ruled by ambitious men who can't get rid of scandals even if they tried. This sounds great - in fairness it's probably not something I would read at the moment when I'm a bit more leaning towards fantasy - but I'm glad you enjoyed it and your review is great. Thanks, Lynn! It was intriguing and well written. This sounds great! I love Robert Harris and am hoping to read this one soon. I don't know much about Vatican politics, so I'll look forward to learning something new. There are plenty of things to learn in this book. I hope you like it. You seem to know a lot about Vatican politics! which I do not. Robert Harris has written quite a few books. I've not read one, but he seems to be a good author eh? His books are usually well regarded. I'm glad you liked this one, I'd probably learn a lot from it. I think you would enjoy it. One doesn't have to know anything about the Vatican in advance as he writes insightfully, but it may motivate one to read more on the topic. In addition, the story moves at a fast pace. I've read some of Harris's books that are set in ancient Rome and always found them well-researched and filled with interesting details that brought that culture to life. Sounds like this book does the same for the Vatican. Yes, he writes well and his research shows. I also read his book Pompeii and found it gripping and memorable. You know what, Carmen? My other half has just finished reading this book. He loved it a lot. Great book review. Nice you are reviewing books again. Thanks, TRT! Yes, I'm trying to read more but in turn I'm watching fewer movies lately. It's a trade off.